Tim Wolf is one of the founders of Parallel destination club, which merged with Solstice last year. We recently talked to Tim about the growth and development of this ultra luxury destination club. Tim is also a 3rd generation real estate developer and his family business, the Wolff Company have 55 years of experience in real estate design, development, ownership and management. It's this background that motivated Tim to start Parallel with his co-founder Chad Morse in 2005. Fairly early on in 2006 Tim was introduced to Graham Kos (co-founder of the Solstice Collection) through a mutual friend. The two clubs quickly realized that they would be either competing or they could join together to create one of the leading ultra luxury destination clubs. 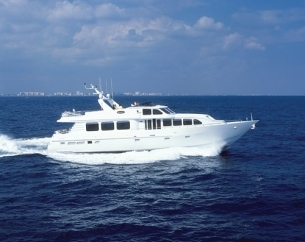 Over discussions on the club yacht Solstice I (pictured right) they agreed to combine and Parallel merged with Solstice in November 2006. One thing that helped the decision to join the clubs together is that Graham had done a phenomenal job of buying what Tim describes as "Architectural Art". The club homes are unique and exceptional residences, which are also immaculately furnished and decorated thanks to the skills and attention of Grahams wife Shay. It's Graham who spends a lot of time searching for these amazing homes. Shay then puts in all her attention to the interiors, fitting them with fine antiques and collections of art, combined with gourmet kitchens and state of the art electronics and communications. Solstice recently announced the locations for its next homes. In Anini Beach in Kauai the club is currently building its own homes, and decided to build because it is hard to find the sort of construction and architectural quality (right on the coast) that is a hallmark of all the clubs homes. In the West Village neighborhood of New York City the club has found two Zen-inspired glass townhouses which will soon be added to the collection. Other homes will be in Switzerland, Brazil, Kiawah, Florida and the Bahamas with the plan to add $60m of homes over the next two years. However Tim added that the growth restrictor is finding quality homes and the club will only grow if it can provide homes and service that meet its exceptionally high standards. About 15% of the clubs members are currently from outside US, and the figure is higher than this for folks that are currently talking about joining. Tim noted that prospective members recognize the unique nature of the clubs homes and then want to understand the clubs model, and how much of the deposit goes in to real estate and how their membership fee is protected. He explained that all members receive audited annual financials and the club guarantees that 80% of the member deposits are either in real estate or cash. As part of their evaluation of the club members can go through the financial structure to fully understand the club and its openness. It's one thing to have beautiful homes but as a member you want to make sure that you can get to the homes you want when you want. We asked Tim about the availability and occupancy rate of the Solstice Collection homes. Tim told us that the members to home ratio is actually running at about 5:1, so about 5 full memberships for every home. The average occupancy rate across all the homes is in the low 40%, meaning that the homes are not reserved over 55% of the time. It was also interesting to learn the variation in these numbers with the most occupied property being 54% occupied last year and the least occupied was in the mid 30%. So even for the most popular property there is still a lot of availability for members to reserve the time they want. The figures for Aspen over the 5 months June, July, Aug, Sep, Oct showed about a quarter of the days were reserved. Tim explained that the Napa residence is very busy over the summer and into the fall, while the Aspen residence is relatively quiet during the summer. In the winter months these roles are reversed as members head to the clubs mountain homes for ski season. If you're looking at joining a destination club we recommend that you should ask the club to show you the booking system before joining. Most of the clubs have online booking systems for members to reserve homes, and by looking through it before you join you can get comfortable with the way it works and also get a first hand view of the availability of the homes. With last weeks announcement of their Best of the Best award Solstice is clearly establishing itself as one of the leading ultra luxury destination clubs. The other clubs in this ultra luxury category include Ciel Club and Yellowstone Club World.